Whether the pain is mild or severe, it is important to deal with any type of Disc issue promptly so that the issue does not progress and cause more permanent and serious damage. Let’s go over some of the symptoms of disc injuries to helping you to understand what you are dealing with and how we can help to not only correct your Disc Injury but get you some immediate relief from the pain and discomfort associated with a disc injury, as well as possible long-term recovery maintenance that will result in the end. A Protruding or Bulging Disc occurs when the disc becomes asymmetrical and the gel is literally pushed out or bulging. A Herniated Disc is when the disc material has ruptured through a crack in the tough outer casing and the soft interior pushes outward. 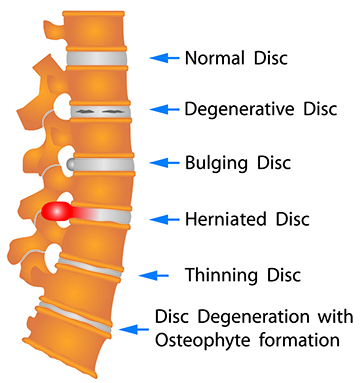 A Disc Extrusion is a degenerative spine condition where the nucleus material of a disc pushes out into the spinal column. While not necessarily painful, this condition can potentially compress a nerve, causing neck or back pain, among other symptoms. Moss Chiropractic of Inverness has a proven track record of providing both short-term, immediate pain relief and long-term corrective care and recovery when treating many Disc Injuries like those listed above. A chiropractic treatment at Moss Chiropractic can involve an array of diagnostic assessments such as your full medical history, an in depth examination and range of motion study, a posture analysis, motion study x-rays and much more based on each patients individualized situation and needs in order to determine the extent of the disc injury and the appropriate treatment plan. Moss Chiropractic of Inverness has many different treatment options available which are based on the age, health, abilities, specific needs and comfort level of each patient. The approach that is taken is always individually tailored to your specific issue and will always be addressed after the doctor goes over all of the findings in depth. Dr. Moss sets special one on one times with patients to go over his findings in detail, answers all questions and explains his very best recommendations before proceeding with any treatment plans. Heard of Non-Surgical Spinal Decompression? This unique, integrated systme of care delivers dramatic pain relief, quickly, safely and effectively. We are proud to say that all of our treatments are non-surgical, non invasive and drug free. Our in house, Non-Surgical Spianl Decompression heals damaged spinal discs by creating a reverse vacume, healing environment within the spinal discs that allows water, oxygen and nutrients to flow back into the damaged disc area. The disc begins to rehydrate, oxygenate and rehabilitate. This procedure is FDA Approved, safe and effective with no known side effects. During each session a patient will lie on our comfortable padded table, can read, relax, even sleep as the environment is so comfortable.